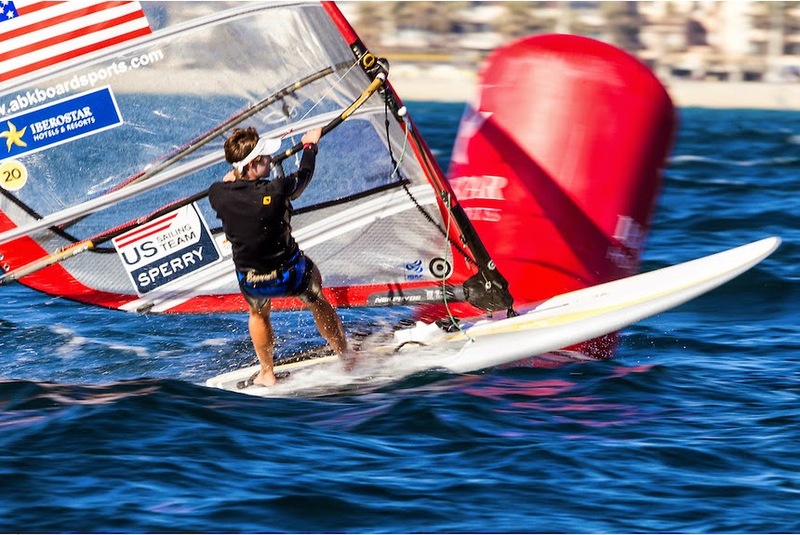 I recently started the European portion of the year with the Eurosaf regatta in Palma de Mallorca, Spain. This event will be used as the second of two regattas in the US Olympic Team qualifying series, starting in Miami 2016. Palma is an interesting event and usually one of the largest Eurosaf competitions. Because of the recent limitations on ISAF World Cup entries to the top 30-ranked sailors and the approaching Olympic year, Palma had a fleet of 70 RS:X women, one of the largest I’ve seen. Conditions here are usually very tricky. Because the island is mountainous and we sail in a C-shaped bay, wind is extremely gusty and shifty. On our first day of racing, there was 25- 30 knots of wind on the other side of the mountains; the racing was still postponed due to 60-90 degree shifts, holes of no wind and 25 knot gusts - this isn’t an exaggeration! With big waves and a long wait time on the water, it was a very challenging day. However, Palma also has great sunny sea breeze days. This week was a nice combination of both conditions. With mostly planing conditions during the event, my focus was to raise the level of my tactics and strategy in a large fleet. Things happen fast while sailing fast, and it’s easy to make positioning mistakes when one bad tack can cause you to lose a third of the Gold fleet. Strategically, we had three different kinds of planing conditions. Being able to work on executing tactics and positioning in these conditions with a coach was a huge opportunity for me, and although my racing was a little on the experimental side during this event, I made major gains to my understanding in this area. My goal this spring is to pass this next step in my racing. With the good speed and board handling I currently have, mastering positioning in planing conditions will give me my next jump up in the results. I’m also happy to say I qualified for the Olympic Test Event in Rio de Janeiro. The Test Event will be a good preview of what the fleet at the Olympic Games will be like, and will determine the steps I need to take to achieve my best result at the Games. Next up on my agenda is the Hyeres World Cup, starting in two weeks. This is one of my favorite events of the European season and will be the seventh time I’ve competed in this regatta. I’m looking forward to being at this professional venue.